COPE observing facilities and study area (background). Clockwise from (top left): Chilbolton radar, NCAS X-Band radar, NCAS wind profiler, MOCCA aircraft, BAe 146, and UWKA. Physics and dynamics of clouds is a cornerstone of the department and remains a key area of research among much of its faculty. The objective of much of this work is to better understand cloud microphysical processes through observation (French, Snider, and Geerts) and to improve the representation of these processes in numerical models (Lebo and Liu) from the cloud scale to the global scale. 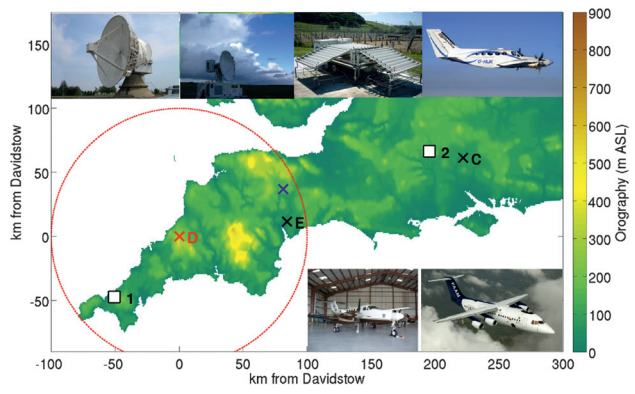 Feedbacks between cloud dynamics and microphysics are investigated through the use of the Wyoming Cloud Radar and Lidar (Geerts and French) and can be further studied through detailed in situ measurements from the Wyoming King Air (French and Snider). Some investigations focus on aerosol-cloud-hydrometeor interactions and feedbacks (Snider, Liu, and Lebo), while others may be concerned with the natural development of precipitation in clouds through warm and/or cold processes. Questions regarding the efficacy of and processes through which cloud seeding may affect the natural evolution of clouds are being addressed through current research projects. (French and Geerts). Likewise, understanding of systematic differences of cloud characteristics depending on cloud type, location, and temperature (Liu) are key to addressing climate feedbacks.